The March of Time tracked the growing militarism in Japan, suggesting that the nation is hungry for conquest after conquest. (1) The scene shows warships then (2) Saionji, then (3) soldiers and more signs of war. (5) Shows Japan's conquered territory; while (6) indicates Saionji's watch may be coming to an end. This issue seeks to offer a theory of why a militant mindset has taken hold in Japan, and points to America's rejection of racial and military equality with Japan. Prince Saionji is cast as the last man who can hold back a crisis in Japan. 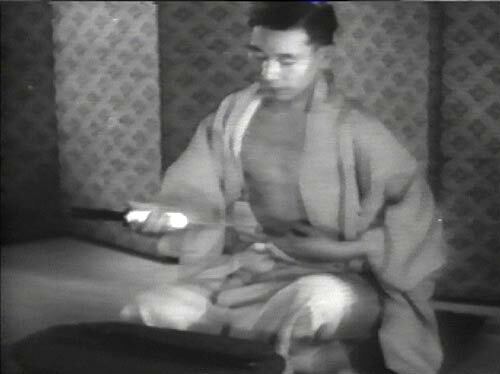 As the film opens he is in his modest home in Okitsu, where he can see warships off the shore (1). The war ships mark "an internal struggle between men of war and men of peace to control Japan's national policy." The struggle, the Voice of Time explains, rises from different conceptions of Japan's national prestige. In London, American and British officials meet with Japanese representatives at a naval conference; the Japanese representatives may lose their lives if they come back with anything less than "recognition of Japan's moral right to a navy as big as anyone's." Here the film displays willingness to make fun of Japan, as it describes "bullet-headed admiral Yomomoto." With America unwilling to yield, "Japan formally denounces the naval disarmament treaties." The Voice of Time explains that the key to understanding Japan's "militant mood" lies in 1919 when the Treaty of Versailles is decided. 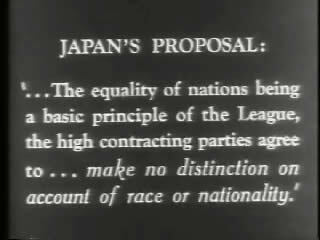 Japan wanted the League to covenant racial equality; an intertitle shows the desired addition: "The equality of nations being a principle of the League, the high contracting parties agree to make no distinction on account of race or nationality [author's italics] (4)." Wilson vetoes the request. By pointing to this as a reason for Japan's anger, The March of Time may be suggesting that the United States' rejection of such a democratic expression it should, in theory, agree with (and in reality could not approve of in light of segregation at home), created a domino effect of events that could come back to haunt the United States. In a 1922 naval conference, President Harding deals another blow to Japanese pride. Japan is allowed only three ships to America's five or Great Britain's five. In 1924 William Randolph Hearst puts through the Yellow Peril Law, which prevents more Japanese from settling in the United States. "Modern Japan cannot understand this discrimination. She feels her way of life is as civilized as any nation," the Voice of Time explains. In 1926 Emperor Yoshohito dies, and new emperor Hirohito holds the military in check for five years. But the bombing of Japanese railroad bridges is used as an excuse for militarists to drive the war machine into Manchuria, "then wait to see what the world will do about it. The world does nothing.... Japan thrills with conquest." After that, militarists cause one political crisis after another. The final scene returns to Prince Saionji as he waits for "what must come to all men"—death! (this is a favorite phrase in the radio show as well). "When death comes to him, what then will hold Japan in check? One answer is Russia," the Voice of Time says. Soviet war planes could bomb Tokyo if necessary. The final scene has Saionji nodding off—he could be dying (6). The Japanese threat of further conquest is not only real, this ending suggests, but likely to be fulfilled. 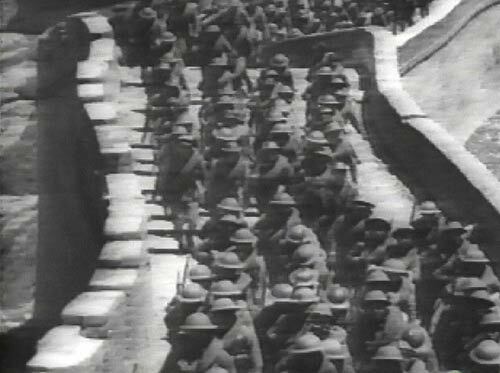 (1) Japan's soldiers on the move on the Great Wall of China. 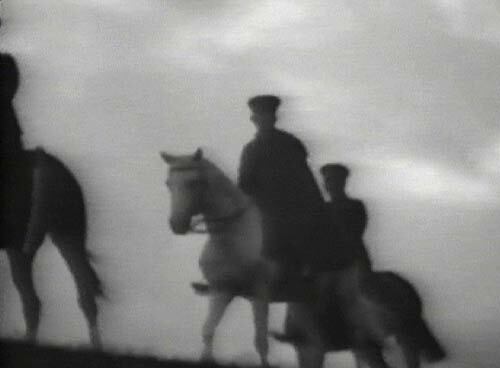 (2) This shot of military leaders is repeatedly used in March of Time films on Japan; are they the horsemen of the Apocalyse? 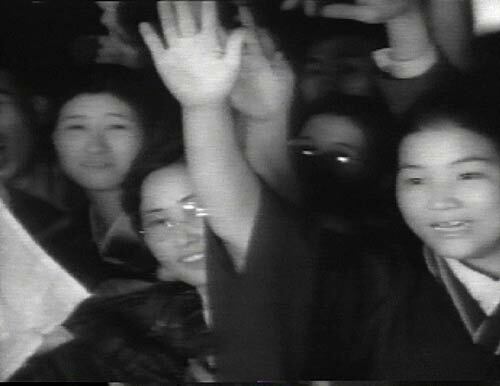 Japan is making its conquered territory of Manchuria into a base for further battles, the Voice of Time speculates in this film. The film details the potential use for Manchuria as one step in a series to conquer China, but also cheerily reports on how Manchuria has benefited from the Japanese. "As time marches into 1936 [shows marching soldiers], the world again hears the tramp of soldiers' feet in Asia. Again they are the feet of the soldiers of Japan. "Four years ago when their army marched into Manchuria, a large portion of Japan's civilian population openly opposed the move. They feared it might start a major war. But the militarists had their way." When Japan's delegate to Geneva staged a dramatic exit from the League of Nations, people at home worried about the consequences. "But the League of 1932 did nothing." Japan renamed Manchuria "Manchuoko," and "Thrilling with national conquest, the Japanese people gave new praise to their emperor, Hirohito." The Japanese people are happy and "Japan faces the future supremely confident in her destiny as master and protector of the Orient." Except for financiers, there is no civilian opposition to militarists. Among an "all-powerful military cast," leader Araki, "the little fire-eater," proclaimed: "The spirit of the Japanese nation is a thing that must be propagated over the seven seas and extended over the five continents. Anything that may hinder it must be abolished, even by force." 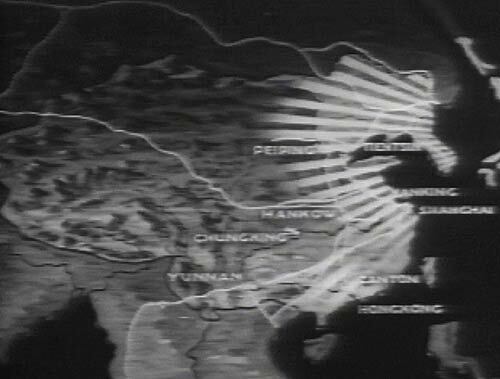 Menacing music plays over an intertitle: "Having seized Manchuria by force, Japan has been busy for four years making 'Manchukuo' into a base for further conquests." Cheery music again plays as the Voice of Time notes that "the capacity of Manchukuo's iron and steel works is being doubled....But the principle raw material of the new province is humanity—30 million Chinese and Mongolian whom Japan must convert into useful producers, profitable customers, dependable friends. To them, modern medicine and hospitals have come with the Japanese. Modern quarters for the lowest Coolie laborers. Modern schools for the young, always with Chinese teachers. "Among the older Chinese, a movement has been started calling for a return to the virtues taught by Confucius, away from the democratic thought of republic China, back to the imperialist philosophy of China's past and of Japan's present." The Voice of Time continues, "the job of making the country into an army base is about completed." War planes carry advance agents into the next area of conquest. Five northern provinces of China are "Japan's next objective." From the provinces, "the Japanese profess to see great danger from Communist agitators." The Chinese national government has a choice of war with Japan "or unhappy acquiescence." Japan is already encouraging Chinese generals and politicians to secede from Nanking. "With north China under control, observers predict Japan would then be ready to complete her final, sweeping revision of the map of Asia," including annexing China, Mongolia, and parts of Siberia. Intertitle: "But the world's attitude toward wars of conquest, crystallized by Italy's invasion of Ethiopia, has sharply changed." More is at stake for the world in China. "Compared to rich China, where the world's strongest nations have for years had huge investments of hard cash as well as Christian sentiment, scrawny remote little Ethiopia is small potatoes indeed. Yet upon scowling Benito Mussollini, Geneva and Washington are cracking down with economic measures as hard as they can without involving themselves in war. And far more vulnerable than Italy to embargoes and boycotts is island Japan, which must have more oil and steel to make war than Manchukuo can supply, and which must have foreign trade to stay alive. Time marches on!" The narrator suggests Europe and the United States are not punishing Japan for transgressions worse than Italy's. Furthermore, economic sanctions would actually work on Japan because it is so dependent on trade. 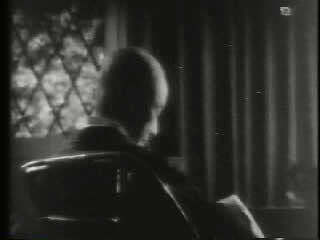 (5) An actor plays the Japanese ambassador, who makes excuses for the men. 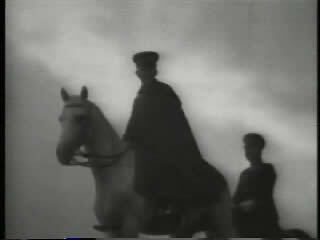 (6) The fateful horsemen appear again. 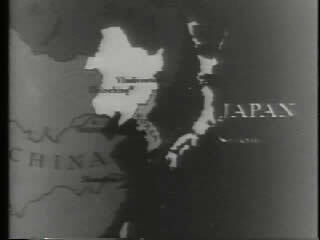 A trumpet call under the title of this film declares the war-like mood in Japan. Japanese military colleges are comparable to America's, the narrator explains. But in America, it is impossible to think graduates would purge the government of what they think of as "evil influences. In Japan such things have happened frequently in recent years." The Voice of Time announces that there has been "another shocking series of political murders by the young militarists of [Hirohito's] country. It is no easy task, apologizes Ambassador Saito, to direct the affairs of a mighty modern nation. It requires skill, intelligence, diligence and experience. No policy will satisfy all of the people all of the time. In Japan, the lot of many people is hard. They eke out their living with difficulty. It is from the peasant population that many of the Japanese army are recruited" [shows peasant farmers]. Soldiers of the Third Infantry regiment have supreme patriotism toward the emperor, Saito explains; they thought that by overthrowing the cabinet, they would be helping to make a genuinely patriotic government. 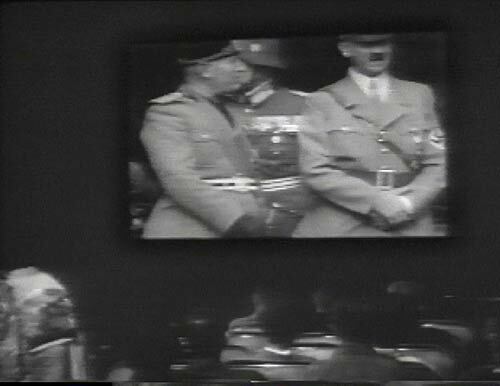 The narrator talks directly to the audience: "You all know what happened. For two days, while iron-fisted military censorship cut off Japan from the civilized world, no one had any idea what was happening. Probably no one will ever know who engineered one of the most cold-blooded atrocities of modern times. But historians can reconstruct a fairly accurate picture." Detachments of the Third Infantry go to the homes of each high government official to kill them. One man, in a re-enactment, is saved by his brother-in law, who is "slaughtered, heroically posing for him." Three prominent statesmen are assassinated, and the military men surrender only at order of Emperor. "A true Japanese patriot can do but one thing if he displeases his Emperor, the son of heaven," the narrator explains, as a dramatization shows a man killing himself with a knife. "'The insurgent subalterns,' says Japan's Saito, 'were all patriots, sincere in the motives, genuine in their loyalty to the emperor, only they were misguided. The incident has been closed.' Closed perhaps for Japan's foreign office is her latest incident of outright military murder. But as Japan's militarists march on behind their emperor, observers may well wonder what a nation whose war dogs go mad at home, might do if allowed to run loose throughout the world." Ominous music plays at this doomsday conclusion. "Time marches on!" Ret. Lt. 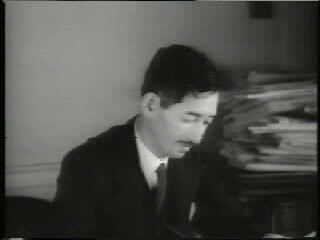 Commander Toto Ishimaru of the Japanese Imperial Navy has written an inflammatory treatise, "Japan Must Fight Britain." There is a debate about a book in the Japanese House of Peers—members of the House complain the publication is responsible for a strained relationship with Australia and the British Empire. Another House member reminds colleagues that a new censorship bill "suggested by the Japanese army," will prevent such tracts from being publicized. An official declares, "Rest assured, these flights of our patriotic imagination, appreciated only by the Japanese mind, will never again be permitted to leave the Japanese empire." Not only is Japan employing repulsive censorship, but the move may only serve to insulate the country further and drum up support for militarism, the film suggests. 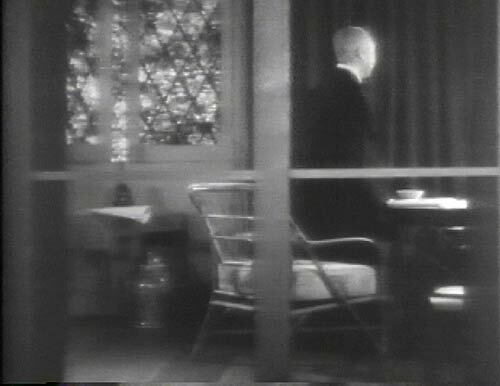 July 29, 1937: Peiping - see "Chinese Resistance"
"War in China," September 10, 1937 - see "Chinese Resistance"
In this segment, a dying Japanese admiral spends his final moments writing a letter to his former U.S. Naval Academy classmates. He has heard that the Japanese are condemned in the American press, hissed at in American theaters, and denounced from street corners and platforms. American sympathies with China have led to widespread boycotts of Japanese products. "American hatred saddens me," he tells his doctor. He writes his classmates that "you must believe the mission of Japan is peace." Did The March of Time staff intend this to play as the ramblings of a disillusioned former war hero? Or are they building a fantasy wherein Japan will turn out to be a friend to the United States? This ad for the new issue of Life advertises "37 memorable scenes" from the sinking of the U.S. gunboat Panay by Japanese war planes. 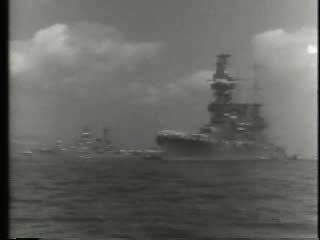 Four U.S. destroyers accompanied the pictures back to the United States so the Japanese could not destroy them, the narrator explains. The event "will remain a landmark in the history of American relations with the Orient...It is a salient example of Life's primary purpose: through pictures, to inform." This radio report focuses on the tactic of bombing civilians to soften up the enemy and create support for surrender. The aggressors in the segment—rebels in Spain (helped by Germany and Italy) and Japan—are portrayed as immoral by The March of Time. Each day in Spain and China for months, bombers leave behind a toll of children who bore no arms. The narrator calls these the "battlegrounds of modern war." An actor playing Assistant Secretary of State Sumner Wells addresses those bombing civilians: "Serious hostilities anywhere in the world may affect the interests of the United States. When the methods used in the conduct of these hostilities take the form of ruthless bombing of unfortified localities, with the slaughter of civilians, in particular women and children, public opinion in the United States regards such methods as barbarous." As his voice fades out, the segment then dramatizes a Japanese bombing mission; planes buzz realistically as they take off. [Wells' voice fades back in] "The U.S. government emphatically protests against methods and acts which violate the most elementary standards of humane conduct which have developed as an essential part of modern civilization." The whistle of a bomb is heard. The first bombs hit Canton, "casting a fleeting shadow on a white roof," and hits a French hospital with 450 civilian patients. Ominous music plays. A "witness" says they counted 75 bombs on Canton within a few minutes. "The Japanese seemed to concentrate their attacks on the most thickly populated areas," he said. A home for aged women was also struck, and a 15-year-old girl and baby died. "A wounded mother clasped the mangled bodies of two babies in her arms. 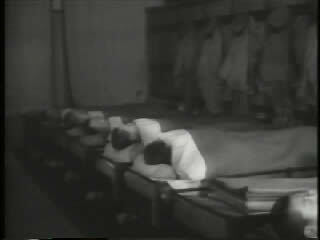 The dead were too thick to count—it was the worst air raid of the war," the witness recounted. In Tokyo's foreign office, a Japanese official faces news correspondents. Were U.S. protests of attacks on civilians received by Japan? Yes, but "we did not molest civilians." A newsmen notes that almost all the dead were civilians. "If so, gentlemen, they were undoubtedly killed by careless Chinese anti-aircraft fire." Canton is not defenseless, the official further explains. "Japan does not want intervention from any source...the bombardment will continue with even greater sincerity." The Voice of Time notes that in 12 days of bombing raids there have been 1,200 bombs, 3,000 civilians dead, and 7,500 civilians wounded in Canton. The Voice of Time repeats his classification of such tactics as "the battleground of modern war." The idea that America might face the same treatment if it entered the war likely made some Americans oppose intervention even more. 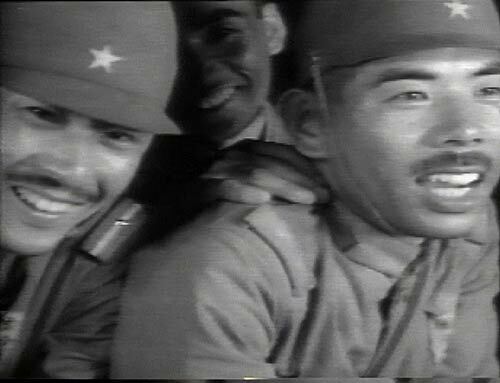 (2) Japanese soldiers leave on a train and look out at their loved ones (3) who wave goodbye. This kind of scene served to humanize the soldiers and their families. It supports the idea that a few military leaders, who have imposed propaganda on the country, are the ones to blame—not the nation's citizenry. This segment describes the conditions that make militarism an attractive option for the Japanese, but it also details Japan's informal alliance with other Axis powers Germany and Italy. Japanese men shipping out for the undeclared war with China get a "hero's farewell." Citizens hear propaganda over the radio of battles gloriously won, "to implant in every Japanese mind that the war in China is a holy crusade, blessed by the Shinto gods." The Shinto religion teaches that soldiers who die in battle are revered as gods. Intertitle: "Though called a 'Holy War' by Japan's militarists, to the rest of the world the invasion of China has been unprovoked military aggression by an ambitious nation." The March of Time is sympathetic when talking about life in Japan, suggesting that the quest for natural resources and a militaristic regime have contributed to war fever. Only 50 years ago Japan was a feudal empire. Now many live in cities, attend modern schools, and adopt every measure to improve the health of their children. "But more important" is "respect for old traditions." They believe their emperor is a god, but "well do the Japanese know that it is not the emperor, but those who have access to the emperor who really rule Japan," the narrator leers. Japan is now in "the hands of a powerful military cast...the single policy of this cast of militarists is war," the narrator explains." To justify conquests, leaders point to the size of the island, which is cultivated on every inch and has almost no natural resources. The average family of five earns $16 per year. Girls work for only 2.5 cents per hour in textile mills. "With the advantage of an endless supply of cheap labor, Japan has invaded every market on earth, become the most formidable competitor of the western nations, its exports increasing every year, despite restrictive tariffs." However, two years of war interrupted this profitable cycle, and the currency value is decreasing. They must pay cash for raw materials for steel mills and munitions plants. 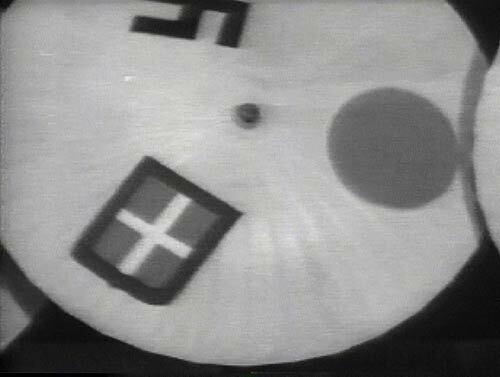 An intertitle explains that Japan is "still paying for an earlier militarist adventure"—the seizure of Manchuria. The territory has became "a costly burden"; Manchuria's iron ore has such a low grade that it's made at a loss. 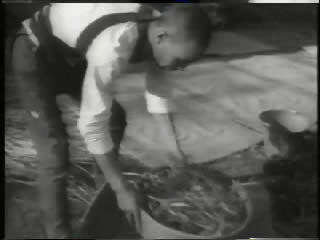 But the country does have unlimited Chinese labor from which to make a loyal population to support Japan in wartime. "Japan needs Manchukuo if she is to become master of the Orient." An unconquered army of a million Chinese men, women and children fight for China. "Although China's casualties have been staggering, replacements are inexhaustible. Less plentiful are the costly machines and munitions of war. But recently from Great Britain and the United States have come loans to bolster Chinese credit." There will be no victory for Japan until "[China's] millions and their leader have been crushed." Intertitle: "But greater obstacle to a final Japanese victory than China's armies is the weight of world opinion—overwhelmingly unsympathetic to all aggressor nations." The United States and Great Britain finally are upset about Japanese aggression, and for months the treaty-protected international settlement of Shanghai has been under siege. The United States, France, and Great Britain has landed armed detachments from ships of Asiatic fleets to protect their nationals. In the meantime, Tokyo has launched new propaganda—the Rome-Berlin Axis now extends to Tokyo—and they're popularizing their powerful partners. 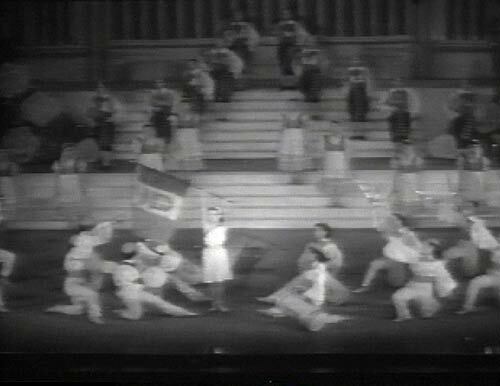 The film depicts a vaudeville show glorifying Rome and Berlin (6-7). "There are many thoughtful Japanese who fear that their militarists, seeking mastery of the Orient, may involve Japan in grave difficulties." They see great nations stationed nearby "which in the past for the sake of peace have excused Japan's overt acts and violence. And today thoughtful Japanese know that the people of these nations are rising against the world's aggressors, rising against the lawless men of destiny, whose violence and ruthless conquest is shattering the peace of the world." Anger seems to be mounting in this issue against the conduct of Japan and other aggressors.